By the year 1928, Germany now possesses a dense road network where the combustion engine has triumphed over electric and steam and cars are now produced via assembly line. Manufacturers are now producing cheaper cars for the broad population. 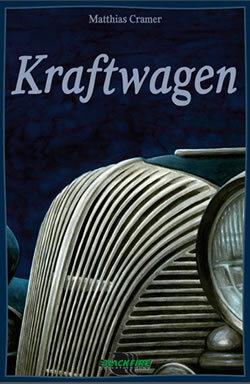 In Kraftwagen, players advance the state of automobile development and production by playing as young car companies. Players must research new technologies and build improved chassis and engines for cars. Early Grand Prix races will earn the young car companies prestige and money but the player must maintain a key balance to fulfill the demanding preferences of buyers at the lowest possible prices. The player who has earned the most money after three game rounds will be the winner. Will you succeed and be mentioned in the same breath as Daimler, Benz, and Opel? 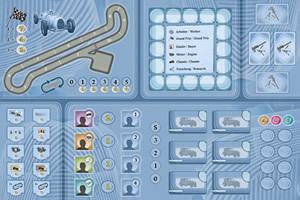 Kraftwagen is Matthias Cramer´s ninth game. In 2012 his "Lancaster" won the Dutch Game of the Year award. His "Rokoko" was nominated for German “Kennerspiel” (“gamer's game”) of the year in 2013.